I’m Piers, and I’ve been working for the Skills Funding Agency for over nine years. In that time I’ve have various roles including: Project Administration, Contract Management, Finance, Junior Business Analyst and Agile Business Analyst. In January 2015 I started my new job as an Agile Delivery Manager. Since the Agency moved to agile development, I’ve become increasingly interested in how agile can deliver better products and how it compares to the traditional waterfall approaches that we have used for many years. When I was an Agile BA, I had the chance to work in an established agile team. My experience made me realise that I wanted a Delivery Manager role to be the next step on my career path. I spoke about my interest to my manager, and have now been given the opportunity to work as an Agile Delivery Manager on a six month secondment. I am writing this blog to track my journey in my new role, and as a way to ask the wider GOV.UK community to offer help and advice! I'd love to hear from you, so if you have any comments or questions, please leave them below. So a new year and a new role… and a little unsure of what I am supposed to be doing! I spent the first day back catching up with the team, going through emails, and getting back into the swing of things. By the end of the day I had a long to-do list for the week ahead! I tend to get into the office for 7:30am, which gives me almost two hours of uninterrupted time. During my first week I used that time to get some admin done, create our high-level road map and set up our sprints, planning sessions, backlog grooming sessions, show and tells, and retrospectives. By mid-week, knowledge transfer was underway, requirements were being written, and the team was working well together. On the Friday we also moved into a larger room as the team was getting a little cramped. Room moves are very good for team building! Everyone chipped in and worked well together to get the room set up in the best possible way. Our first daily stand-up meetings went really well. 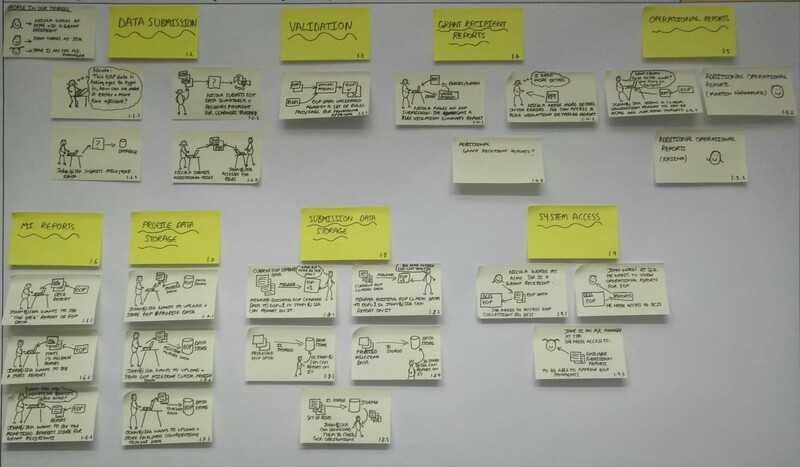 “Stand-ups” are common in agile development, and give everyone in the team a chance to report on progress and plans. I also met with the Agile Development Group. The group is made up of people working on different agile projects across the Agency. We get together to share ideas and to get advice on current issues, and talk about how we can ensure we meet the GDS service standards. We also discuss what we need to do to help the Agency become more agile. As I’m new to this role, I’ve been given a mentor. I met and spoke to him several times during the week to get tips and advice. The week ended with a kick-off meeting with the project’s main stakeholders. I delivered part of the presentation and we got some good comments and questions, and some issues were raised that I’ll be following up on. The meeting was also an opportunity to clearly set out the project goals for our stakeholders, and to begin the process of getting people engaged with the project. is this is something I can do? what is the rest of the team’s impression of me? is the team doing what they are supposed to? are we doing things at the right pace? is it getting really warm in here or is it just me? Stepping back, I realise it’s understandable to have these thoughts when starting a new role. Luckily I’ve worked for the agency for nine years, so I know the business and a lot of people here. I’ve also been offered a lot of support and I am grateful for the opportunity to try something new and progress my career. Our team is growing, and we're currently advertising three new Delivery Manager jobs. So was it getting warm or was it just you? Ha! It was getting warm, the room we had was getting very cramped and the team was not fully formed, luckily we were able to swap for a larger room with another team that was smaller. The move was a really good team building exercise, working together to figure out how we would best fit in. It still gets warm but its much more comfortable. I am a permanent member of staff yes. I started my career at the agency at the age of 21 in an administrative role. The Agency has granted me the opportunities to progress my career within the 9 years I have been here (today actually being my official 9 year anniversary although I did have temporary administrative role with what was then the Learning and Skills Council before starting a permanent admin position on the 6th of February 2006). I have always taken the opportunities to take secondments to different areas of the business to see if it is something I would enjoy doing and most of the time they have been within the projects I have been working on. My biggest change was when I moved from the contracts / finance area into the area of business analysis. I have been improving my knowledge and skills in this area ever since. When the Agency started adopting agile ways of working I became heavily involved and firstly took up the role as Agile Business Analyst before taking up my current role as a Delivery Manager on secondment.